One day last week, I jumped on the ESPN website, clicked on the college football news ticker and half of the stories were about players getting arrested over the summer. One recent report said that Ohio State coach Urban Meyer spent an entire news conference at Big Ten Media Days explaining off-the-field problems. Players across the country have been arrested for assault, possession, DUI and other offenses. At my alma mater the University of Florida, linebacker Antonio Morrison was arrested for, get this, barking at a police dog. I guess he was harassing the dog. Not sure what to make of it but the quote was amusing: “I walked by and said ‘woof woof’ and they arrested me,” said Morrison. The charges were later dropped. The cop admitted he was having a bad day. And pro football’s police blotter is jam packed this summer. Leading the chain gang is former New England Patriot tight end (and also former Gator) Aaron Hernandez who now resides in a Massachusetts jail on first-degree murder charges – and is being investigated in another double homicide. 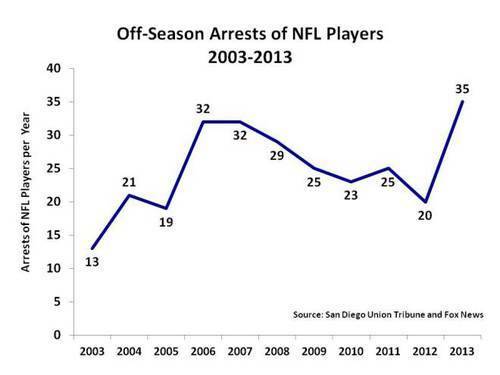 NFL arrests are up 75 percent this off season. How do they know an exact percentage you ask? I will answer that question with a question: Would you believe me if I told you there was an NFL Arrest Database? It exists and like any good database, it’s searchable so you can find out that the Miami Dolphins, for example, haven’t had an arrest since last November when defensive back Jonathon Amaya was charged with battery after allegedly choking a cab driver – classy. The Tampa Bay Bucs, however, have had five players arrested this offseason with the most interesting being defensive end Da’Quan Bowers who was arrested after a .40-caliber handgun was found in his luggage at New York’s LaGuardia Airport. The Jacksonville Jaguars haven’t had anyone arrested in more than a year, rounding out the teams in my home state. Labor economist Stephen Bronars analyzed the arrest database and found that 0.78 players per team are arrested each off-season. He also broke down arrests by position: Wide Receivers accounted for more than 1 out of 6 arrests. Cornerbacks accounted for about 1 out of 7 arrests . Linebackers 1 out of 8. Punters and Kickers 1 out of 67. Offensive Guards (a more benign bunch) accounted for only 1 out of 107 arrests . The Cincinnati Bengals, Minnesota Vikings and Tennessee Titans were among the teams with the highest arrest rates, doubling the NFL average. So what’s going on with football these days? Why so many players in the pokey? And do we have a public relations problem here? The standard answers still hold true. Football is an extremely aggressive, testosterone-pumping and violent game – yet that doesn’t really explain the punters and kickers. And during the off-season, these guys have a lot of time on their hands – and the pros have plenty of flash money. Apologist-sounding answers aside, I think the NFL and big-time college football need to address this image issue sooner than later. Reputations and ticket sales are at stake. Go kiss some babies. Football needs to redouble its efforts to have its players out in the community – either doing good works or teaching kids how to throw spirals. Is Punt, Pass and Kick still around? I have an 11-year-old son who has never heard of it. By the way, it still exists but a quick check online shows that there are only two competitions within 50 miles of where I live. The players, at both levels, need to bond with their communities and spend more time with their fans and less time “in the club” at 2 a.m. on a Wednesday. Pump up the volume on charitable efforts. Philanthropic arm NFL Charities gives away $10 million per year, but aside from a few commercials you see during the season, you wouldn’t know it. The good deeds done by college and pro teams need to max out the publicity budget. The fans need to see that the players, coaches and ownership do more than count money and get in trouble. It’s a privilege not a right. This is a longer haul tactic but through some combination of bigger penalties for misbehavior (outside of the judicial system) and building a greater sense of pride in themselves and the game, the NFL and college football have to instill in their players that it is a privilege, not a right, to play the game. It won’t be easy. They have to start with tough penalties such as “No strike” policies when players commit domestic violence or for gun charges, for example. Bans for repeat offenders may need to be the norm. Penalties must say, loud and clear, that bad behavior won’t be tolerated. And they must beat the drum that they have a responsibility, just like the rest of us on the big blue marble, to be good citizens. Training camp is starting and much of the focus will now turn to the field, but the NFL and college football need to keep an eye on off-field behavior and plan for the next, hopefully uneventful, off-season. What do you think? Have off-the-field issues changed your perception of big time football?